If you weren’t watching Samsung’s TV event and LG press conference you might have missed it. The curved TV, once considered the whizzbang tech that would save televisions, is dead. Not quite in the ground, but no longer the darling of its makers. The curved TV is being quietly shuffled away from the limelight to make way for newer, and better, fads in televisions. Last night Samsung showed off its newest flagship television. The Q9 is gorgeous, compact for its size, and traffics all its inputs on a single cord about the width of fishing line. It is also painfully flat. The display does not curve in the slightest. 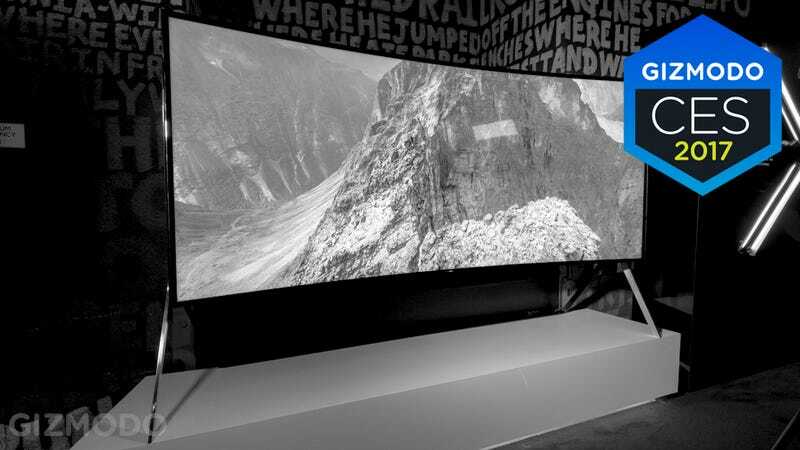 This is very different from years past, where Samsung’s high end curved TVs were the star of Samsung’s show. Flagship televisions tend to possess all the features that are most forward looking for a company. They’re intended to be incredible future-proof sets worth their $5000+ price tags. Televisions that will still wow your guests years after newer and better technology has come along. Samsung reps told Gizmodo that the company still “believes” in curved TVs, and there’s a variant available in the more affordable Q7 and Q8 models. But the exclusion of a curved version in the flagship Q9 is a big deal. Especially when you notice that LG is also leaving its curved sets by the wayside too. Instead its flagship OLED W7's biggest selling point is that it can be mounted practically flush to the wall. Panasonic also now on the straight and narrow. It’s second ever OLED TV, the EZ1002 is completely flat. Panasonic’s first OLED, the now two-year-old TX-65CZ952B, had a distinct curve. So why are the curved TVs quietly being put to pasture? Sales numbers may be scarce, but practical experience with curved TVs isn’t. They’ve always been a shiny gimmick, despite what some people hoped. A curved set gives a person an incredible and immersive view when they’re sitting dead center, but the TV-watching experience is far less fabulous for anyone else in the room. That makes them practically worthless for big Superbowl parties or mighty movie marathons, or anything but one dude, in his underwear, watching TV by himself. So farewell curved TV. You were only around a few years, and you’re not technically dead, yet. But you can just mosey on out to pasture now. No one will miss you. We’ve got sweet TVs with just one cord and giant speakers now, and that’s way cooler.